I recently received a letter from BC Hydro in response to my objections regarding their removal of my analog/legacy meter and replacing it with a radio off smart meter. They claim that the analog meter that they installed only 4 years ago has expired. My original analog meter worked flawlessly for almost 40 years! Customer Relations, Sheliza Mitha, wrote: “As a public utility, BC Hydro is obliged to comply with applicable legislation, and the Electric Tariff as approved by the BC Utilities Commission Due to the terms of the Clean Energy Act and the Electric Tariff, we can only offer a Smart meter or Radio-Off Meter for installation at your residence”. 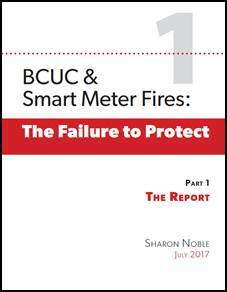 She also wrote: ” Since 2011, BC Hydro has installed approximately 2 million smart meters and there is no evidence a BC Hydro smart meter has caused a fire”. I wonder how much more “evidence” they need. I am mailing the Vancouver Sun and Province articles regarding smart meter fires to her. You have been doing a lot of work on the smart meter issue. Do you have any hope that we can ever change this? If so, how?